F4P was the brainchild of Geoffrey Whitefield (M.B.E), a retired Baptist minister who has wide experience of working in the Middle East joined up with David Bedford, former 10,000 metres world record holder and former Race Director of the London Marathon. They had the vision and the drive, but lacked access on the ground and the technical expertise required for the successful execution of sport-based community relations programmes. The University of Brighton, with its large sports department (Chelsea School), track record in the education and training of sports teachers, coaches and leaders, and global reputation in researching sport and society, was brought on board as a partner. Professor John Sugden had extensive experience in working in using sport for community relations in Northern Ireland with Belfast United and Dr. Gary Stidder had access to willing and keen students and had led coaching camps in the USA. In Israel, the Arab town of Ibilin, headed by Auni Edris and the Jewish community of Misgav, headed by Eli Fraktovnik agreed to be the first on board. 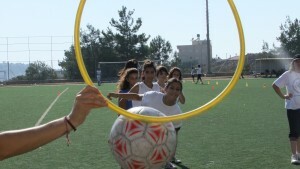 The first formal phase of the project was in 2001 when, operating under the label of WSP (World Sport Peace Project), a team of seven from the University of Brighton conducted a week-long coaching camp in Ibillin for approximately 100 Muslim Arab and Christian Arab children (10-14 years old). The ensuing security situation of a school bus bombing in the neighbourhood caused Misgav to withdraw their children from the project at the eleventh hour. 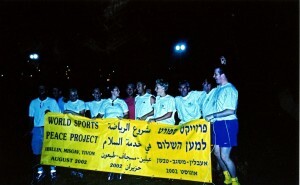 The 2001 project went ahead nonetheless, helping coaches and leaders understand that community divisions in the region were not confined to Arabs and Jews. It also demonstrated from a logistical point of view – fund raising, planning, travel, provision of equipment, and program execution – that a project such as this could be carried out successfully. Misgav joined in 2002 and the programme grew to its height in 2012 with 45 communities involved at 15 project sites across Israel. In 2013 the programme was handed into ownership of the Israel Sports Authority. It was determined that, even though the football coaching had been much appreciated by the children, we had to ensure that what we were achieving was more than simply improvements in football skills. The team felt that they needed to do more to ensure that the contents of that football programme were clearly underpinned by values and principles that fed a broader community relations agenda and also to ensure that those values and principles were appreciated by the local coaches and experienced by the children in practice. Getting children to play together is one thing, but placing them in situations where they had to talk about and confront some of the more sensitive features of their community is far more problematic. Thus the methodology based on research and good pedagogical understanding was born. Alongside was the understanding that local ownership was integral to the success of the programme and that at the heart of any change was not just the children, but their coaches who also had to undergoe a shift in opinion and behaviour to acheive the positive outcomes. Our purpose is to not expand our work but to disseminate our understanding and findings via a number of methods. 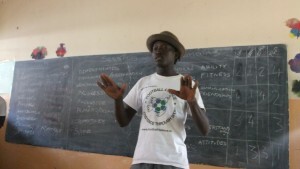 The emphahsis on delivering projects for children has moved to working with delivery partners and providing training for coaches, teachers, youth and community workers in our values based methodology and good practice in sport for development and peace work so that they can incorporate it within their own existing work. We have worked closely with the Univeristy of Brighton in developing content and oppotrunities for practical learning for various degree courses at both undergraduate and postgraduate level.